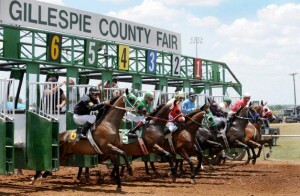 Join us at the Gillespie County Fair for Live Racing on August 25 & 26, 2012! 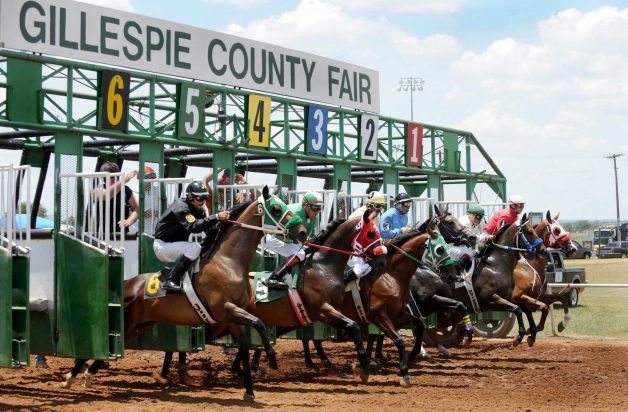 The Summer Season brings live horse racing at the Fairgrounds’ Class 3 track. Live races feature quarter horse and thoroughbred racing as well as special races, trials and futurities. For advance purchase of box seats, please call the Fair Office at 830-997-2359. Post time is 1:00 p.m. each day. Gates open at 11:00 a.m. Races run until about 6:00 p.m. This entry was posted on Friday, August 24th, 2012 at 1:13 pm	and is filed under Events, News & Updates. You can follow any responses to this entry through the RSS 2.0 feed. Both comments and pings are currently closed.